What's That Thing: The little round hole in the elevator door. What’s That Little Round Hole in the Elevator Door? What’s that little hole in the elevator door? What’s That Thing is Slate’s column examining mysterious or overlooked objects in our visual landscape. To submit suggestions and pics for future columns, drop us an email. Elevators made the modern American city. Whether it was the first passenger safety elevator installed in New York City in 1857—“safe,” in that you wouldn’t plummet if the cable broke—or the riverside grain elevators that made Chicago boom, the modern cityscape has been shaped by our ability to casually fly up and down the interior of ever-taller structures. Today, elevators are at the heart of modern notions of mobility, aging, and civil rights. Try navigating a hospital, parking garage, or airport without safe and reliable elevators—especially if you’re disabled. The next time you’re waiting for an elevator, see if you can spot a small hole in the elevator door. In case you are wondering what it’s for, it’s a keyhole. And with the right key, it opens—whether the elevator is there or not. 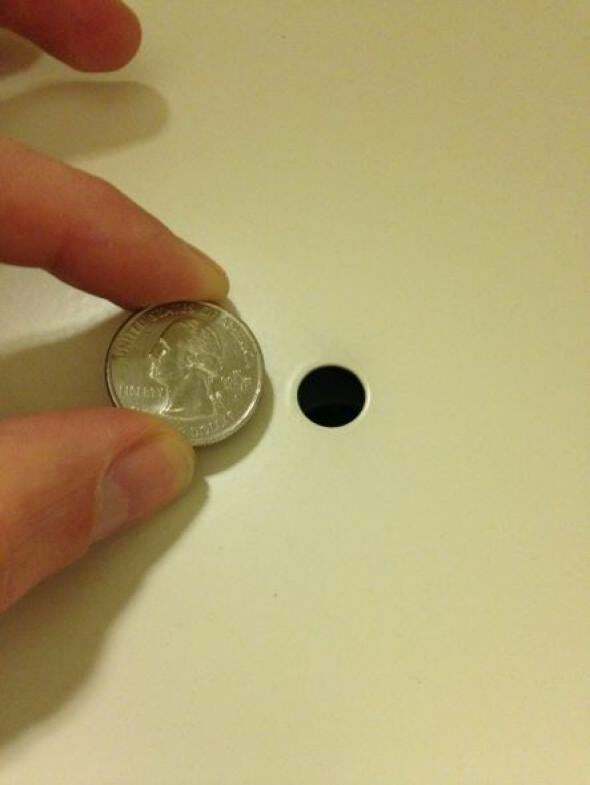 Elevator holes might not be pretty, but they are discreet. Why would you want to open the door when there’s no elevator there? Maintenance, an elevator inspection—or to rescue someone from an elevator that’s stuck between floors. While Brian Black, the code and safety director for National Elevator Industry Inc., a trade association, says there’s no official name for the hole, the key itself is often called a drop key (whether it is actually a drop key, or another kind of key) or a hoistway door unlocking device. The keyhole is in the lobby door, so you’ll see it while you’re waiting for a lift, not when you’re in the elevator. So what happens if you’re stuck in an elevator between floors? It’s hard to be grateful you’re stuck in an immobile elevator, but the most common reason this happens is that a safety mechanism has kicked in. In other words, things could be worse. When people get stuck, one option, according to Robert Solomon of the National Fire Protection Association, is for fire crews simply to wait for elevator mechanics to get the stuck elevator moving again. But, Solomon points out, waiting isn’t always the right decision. The person stuck in the car might be unwell, panicky (understandable! ), in need of medicine, or overheating. And of course there might also be a fire in the building. 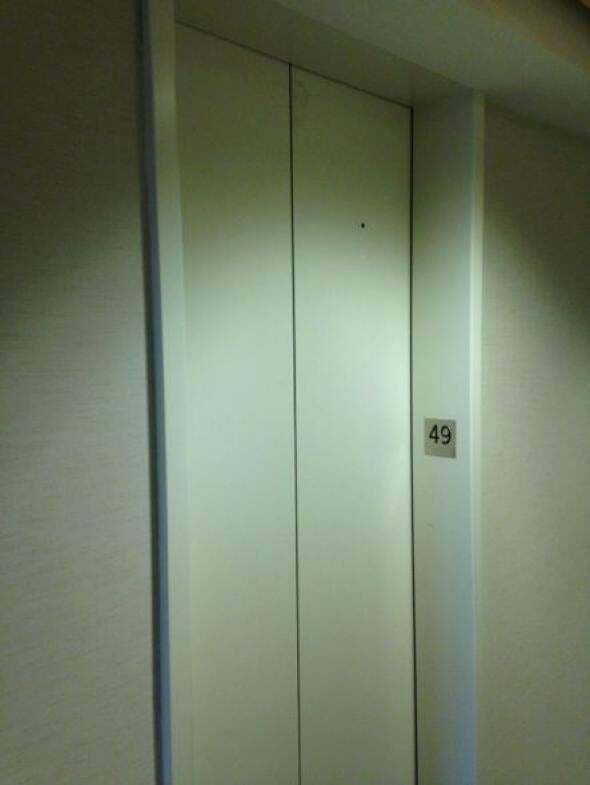 Next time you’re bored waiting for the elevator, see if you can spot a tiny hole in the front. If an “extrication operation” is deemed necessary, there are elaborate rules designed to minimize risks to first responders and other building occupants (you don’t want anyone doing an L.A. Law-style Rosalind maneuver, and you definitely don’t want the elevator to start to move). If you’re stuck more than a few inches away from a floor, the fire crew will generally open the doors in the floor above the stuck elevator car. Christopher Smith of the Schindler Elevator Corp. says the current “standard for evacuation is via an elevator door opened above the car top and then through an exit door in the elevator car roof.” In other words, the fire crew will enter the elevator from above and pull you up to safety. Who benefits from these keyholes in elevators? Solomon points out that the advantages may be greatest for building owners, not fire crews or even those in need of rescue. Firefighters, after all, can easily force their way into a shaft to save someone—they just might damage the doors. Where are these keys kept? Some fire crews may carry them, and elevator technicians will bring them when they’re called out. 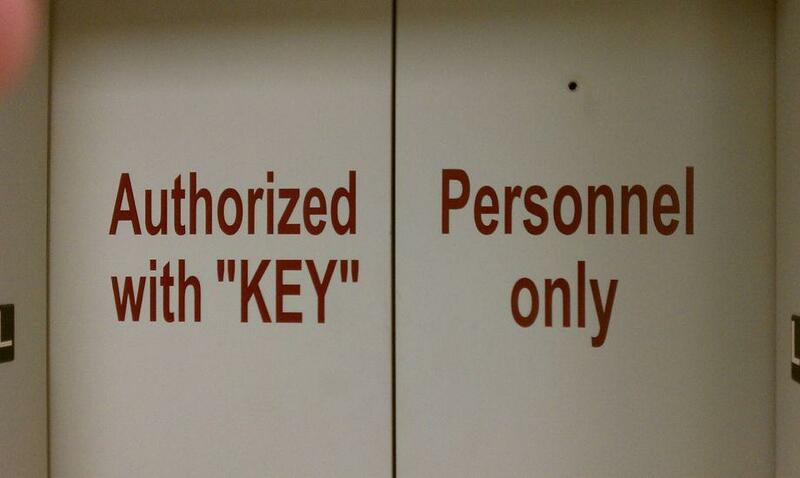 But there are usually keys “located on the building premises,” according to Anderson. Where, exactly, “varies from state to state.” Sometimes they’re in a box near the elevator itself, or accessible by doormen or building staff. They might also be in something called a Knox Box, a safe that holds a number of important keys for a building. First responders will carry a key that opens Knox Boxes in their area—a key to keys, essentially. Knox Boxes are a great idea, but a key to the city isn’t without its own security risks. Interestingly, not every elevator door has a keyhole. Some jurisdictions consider the keyholes themselves a safety risk—they make it too easy for the shaft doors to be opened when there’s no elevator there. Anderson is opposed to keyholes on just these safety grounds. He notes that elevator technicians have other means of opening the doors: If it’s a life-and-death situation, “the emergency responders will do what they have to do and that is usually destruction of the doors.” He also has a secondary objection to the keyholes on purely aesthetic grounds: “They are unsightly,” he said. See something out there in the world you’re wondering about? Send ideas for future pieces to whatisthat@markvr.com.